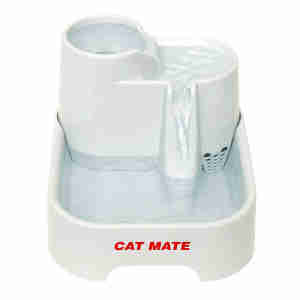 The Cat Mate Pet Fountain constantly filters around 2 litres of water to ensure that it’s pure and fresh for a cat or small dog. This unique multi level design maximises the appeal of drinking with plenty of water movement to ensure naturally oxygenated cool water throughout the day. The re-circulating water provides fresh-tasting, cool, filtered water for pets with a multitude of health benefits including the reduction of crystal formation and urinary disease (fus). Encouraging your pet to drink more water helps promote health and well-being. Very impressed with the product, it's very easy to set up, and very quiet running. Only problem is my 2 cats seem to be totally ignoring it! I have seen one drink from it once - hopefully they are making use of it when I'm not about, but I have left their old water bowl out as well just in case. That's cats for you! I could find similar items cheaper but went with this one due to the reviews as easy to set up. I agree with most pet owners that the cats are not sure about this new source of water for a couple of days but believe me - when you take their normal drinking bowls away they soon get used to it! We top up to the max line every couple of days and we have 5 cats! The water is not stagnant so fresher for them. It has a delicate flow, not noisy or scary for them. We have had this product for around 3 weeks now and due to no debris from fur or saliva have only changed it once as always looks clean unlike your average pet bowl! Just thought we should clean it! Not sure how long the filter willlast5 at this stage but they are not expeensive. Thoroughly reccomend! Bought this as a replacement water fountain for my dogs. A little smaller than my last fountain but much easier to clean as all parts are easily accessible unlike the bottled one I used to have. I fill it morning and evening to keep my three dogs supplied with fresh running water. They love it. My 2 were not to sure at first about drinking from it took about a day to get used to it . Now there love it easy to put together.